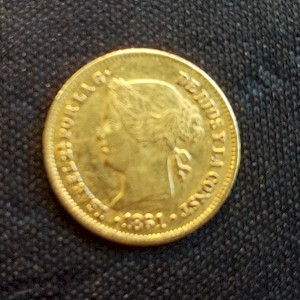 Description: A very beautiful 1 Peso gold coin dated 1861 (the first year of issue), produced by the Spanish monarchy for use in the Philippines (which was a possession of Spain until the Spanish-American war). On the obverse is a portrait of Queen Isabella (Isabel) of Spain. On the reverse: the two pillars, crown, and shield of the Spanish monarchy. Net weight 1.69 grams, 87.5% gold (0.0476 ounce AGW). A nice collectible coin, with old-world history, it�s sure to hold its value, due to its gold content.